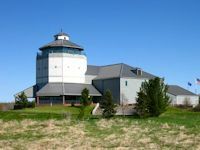 Our favorite bayfield peninsula campground is the Washburn, WI city park on the northeast edge of town - Memorial Park. Nice wooded sites, great Lake Superior views, and clean washrooms with hot showers. Washburn has a second campground at the south end of town that is better suited for RV camping versus tents (and it has an excellent free Wi-Fi service). We also like the Kreher Park RV Campground in Ashland (but it is only for RVs, no tents allowed). See our table below for our campground reviews and lists of other area campgrounds. 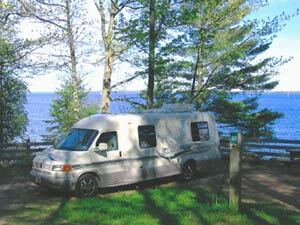 There's some sites at the Bayfield Municipal Campground that also have terrific lake views. Kreher Park's RV sites are quite spacious and all have lake views. An attractive option for tent campers is in the little town of Herbster Wisconsin on the west side of the Bayfield Peninsula. 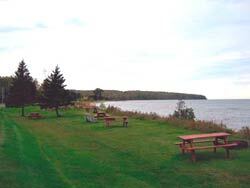 There are several nice tent campsites right on the shores of Lake Superior. Flush toilets, running water, but no shower. On the other side of the frontage road is an RV Park with electrical hookups. 35 RV sites, all with a lake view, are relatively open but spacious. Water, dump station, electrical hookups, boat landing, swimming beach and playground. Adjacent to paved lakewalk. First come, first served. Some nice hiking and nature trails around the marsh and wildlife area. Flush toilets, modern washrooms . . . but no shower. Both RV and tent sites, but it is better suited for tent camping. The scenic Big Rock County park, located adjacent to a branch of the Sioux River, has 15 rustic camp sites (715) 373-6125. . . . Birch Grove National Forest Campground has about 30 campsites, also rustic (715) 373-2667. A little further away from Ashland-Bayfield but offers excellent campsites for tents or RV's, nice hiking trails, waterfalls, and other attractions. 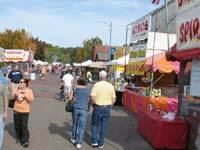 (715) 274-5123 - - - See more info on camping & campgrounds at copper falls state park. Lake Superior Circle Tour Campground Directory. Waterfalls, hiking, picnic area, tent camping. Camp sites mostly rustic, but well spaced and nicely laid out. Saxon Harbor Marina and Campground.